My third book read this year was actually finished in January. So that's like THREE books in one month! Woo-hoo!! 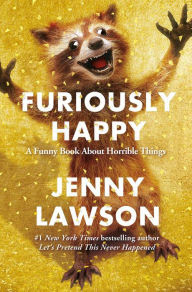 I read Furiously Happy by Jenny Lawson as my 'book that's been on your TBR list for way too long.' I don't technically have a to-be-read (TBR) list, but I remember seeing this mentioned previously and wanting to read it, so close enough. I spent the beginning of reading this book literally laughing out loud. And to show just how out of touch I am, I was thinking to myself, "This sounds JUST like the story about Beyonce the metal chicken," the page before she said something referencing giving Victor the metal chicken. Yay for the Bloggess! I had never realized her 'real' name before. The raccoon? Was really what made so much of the book for me. I was almost sorry to be reading this on my Kindle, as I would have LOVED to see the cover around my house during my reading time. And to think, she actually has TWO raccoons like that? What a lucky, lucky woman. I haven't read this one, but I read her first book for BlogHer Book Club a while back (while they were still doing a Book Club lol) and it was great. I love her blog, too. I tried to read this book. I really, really wanted to like it. I did, it's not that I didn't, but I had a hard time staying interested. it took me a while to finish it. Looks very interesting. Thanks for sharing! Is it a kids book? It looks interesting! The cover of this book definitely makes me laugh. I'm adding to my must read list now! thanks!